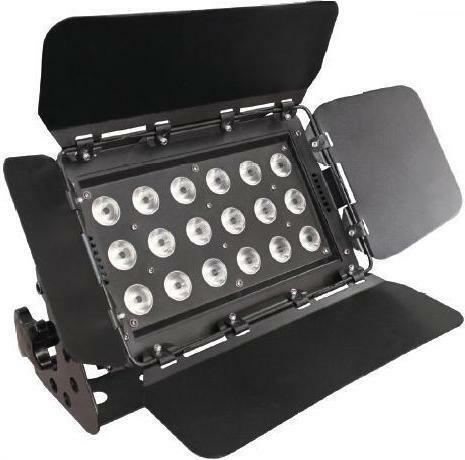 LEDJ Q Colour uses Quad (RGBW) LED technology which is a revolutionary 4-in-1 LED package. Since each individual LED incorporates a red, green, blue and white chip behind a single lens, shadowing and unevenness within the field are things of the past The LEDJ Q Colour provides exceptional light coverage (As good as iColor lights) fitted with barn doors and incorporates a unique hanging yoke which doubles up as a floor mounting stand. Using a DMX controller, virtually any colour or hue imaginable can be created. A 0-100% electronic dimming feature lets you fade and adjust the intensity of colours, while a speed adjustment feature gives you command over fast-to-slow colour changes. With several operating modes to choose from, the LEDJ Q Colour can handle a variety of applications. It can be run in DMX Mode to create customised light shows. It can also be operated in several modes that do not require an external controller: Auto mode (running through internal programmes), Sound active mode (chasing to the music) and Static colour Mode. Additionally, multiple units can be linked together Master/Slave. (The LEDJ Q-Colour can be used with a DMX controller with a minimum of 4-channels).